How Do You Play Night Croquet? Surprisingly, Croquet can be enjoyed under low illumination. Night play has two problems, seeing Wickets....and seeing Balls; of these two, visibility of the Wickets is by far the more difficult (especially with thin wire wickets). Whiteness in this photo is artifact of night photography; Red would be more accurate. Wickets: The Wonder Wicket Light very adequately solves the visibility problem for all types of wickets. Balls: Any ball in the vicinity of a Wonder Wicket Light will be adequately illuminated. 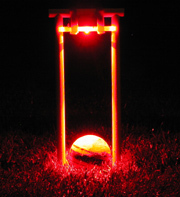 To effectively see balls remote from the wickets, it turns out all that is needed is a little ambient lighting that most yard settings will generally provide, especially when some low level artificial lighting sources such as yard torches, lanterns, decorative colored light-strings and garden-shrubbery lighting are used. Note: Some prefer to paint markings on the balls using Craft paints that are fluorescent; this accentuates and heightens reflection from low ambient area lighting. By using various combinations of stripes, dots, and other patterns, the darker balls can be easily distinguished from one another. Using Wonder Wicket Lights, you will be surprised at how easy it is to play a very enjoyable and competitive game of Croquet under these conditions. 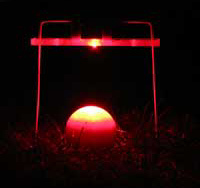 Not only do they facilitate the game of night Croquet, they also provide an attractive light display on the Croquet course. Try them for an evening of camaraderie and socializing with a Croquet flavor.